Home Special Reads Champions in Education – Girls or Boys? 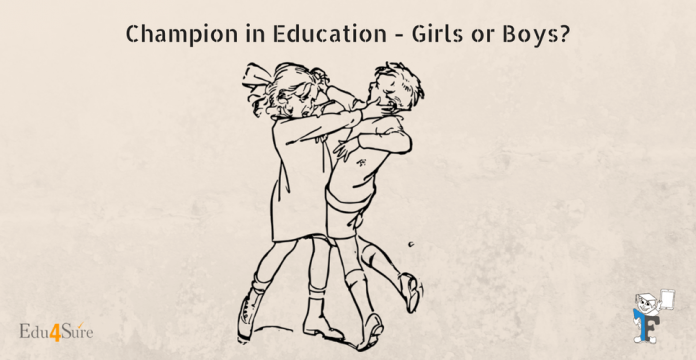 Champions in Education – Girls or Boys? Today is the era of the girl’s power. Pick any area whether sports, media, academics, art, politics. Girls are making their footprints everywhere and making their presence felt in a very powerful and positive manner. A famous quote that describes the girl’s power. “She is free in her wildness, she is a wanderer, a drop of free water. She knows nothing of borders and cares nothing for rules or customs. ‘Time’ for her isn’t something to fight against. Her life flows clean, with passion, like fresh water” – Roman Payne. Girls have proved themselves that if given a chance they can match the boy’s shoulder to shoulder and also outperform them. Gone are the days when it was said that girls are weak in Mathematics and science as compared to boys. The recent study all over the world proves that girls today are performing better than boys in mathematics as well as science. No more they are restricted to the fame of performing better in theoretical subjects. In fact, in Shanghai girls perform better in mathematics than boys. “Girl power in my mind is to let girls be exactly what they are. Let them be angry. Let them be resentful. And rebellious. Let them be hard and soft and loving and sad and silly. Let them be wrong. Let them be right. Let them be everything because they are everything.” – Amy Sherman-Palladino. All over the world, several initiatives have been taken by the government at various levels to encourage the girl’s participation and stressed gender equality, all their efforts have proved fruitful. Girls have proven their mettle. For centuries boys were top of the class. But these days that’s no longer the case. Why are girls performing better than their male classmates? According to a research study conducted all over the world, girls tend to read more than boys. Girls have the habit of reading books. Reading proficiency of girls is better than boys. Because boys lack in their reading skills, their performance in various subjects suffers due to this weakness. Girls are more dedicated to their work. They spend their time doing homework and are more responsible for meeting their project deadlines. This seriousness from the very primitive classes makes them successful at school and this habit helps them in their future endeavors as well. On the other hand, boys are observed to be less serious and reluctant towards their commitments of work, they tend to give more importance to other activities rather than completing their homework and projects. They are easily distracted. This habit is one of the reasons for their scoring less in the examination. This is also a very important reason that defines the reason for the dedicated behavior of girls towards their studies and work. Societal pressure and expectations pose a great pressure on the minds of the girls. The fear of failure and the fear of being judged by the people and the family plays a great part in the girls fearing the failure. Girls are expected to be well mannered and prim and proper by society. Girls concentrate more on creating a good impression on the teachers whereas on the other hand boys focus less on the issue and many times even not bothered about it. This is the reason girls even tend to get good marks in the subject they are not even good at. A recent study conducted at the kindergarten level in united-states proves that girls are more self-regulated than boys. The students were instructed to touch their toes every time they were asked to touch their heads. Curiously enough, remembering such rules as “touch your head really means touch your toes” and inhibiting the urge to touch one’s head instead amounts to a nifty example of good overall self-regulation. The researchers combined the results of boys’ and girls’ scores on the Head-Toes-Knees-Shoulders Task with parents’ and teachers’ ratings of these same kids’ capacity to pay attention, follow directions, finish schoolwork, and stay organized. The outcome was remarkable. They discovered that boys were a whole year behind girls in all areas of self-regulation. By the end of kindergarten, boys were just beginning to acquire the self-regulatory skills with which girls had started the year. This contributes greatly to their better grades across all subjects. This self –regulation continues lifelong. The secret remedy of success is self –regulation, and discipline. Boys start thinking about it!!! Girls have a good memory, also they have a habit of jotting down notes, revising them on regular basis, unlike boys who don’t even carry a register and a pen in the class. That’s my personal observation!!! Boys generally skip writing notes. This habit of writing results in good retention of the data being studied thus contributes positively to the examination and proves to be a boon in exams. Girls tend to retain the lectures more because they have good listening skills. They transcribe what professors say more accurately, and remember lecture content better. I am an MBA student and it is my personal research and observation that girls are more active in every arena whether it comes to extracurricular or various short-term projects. After the result of the first trimester, this was reflected in their grades. The top 3 students were all girls. Also, girls tend to have good analytical skills as was observed by me during various competitions pertaining to business analytics, case study analysis, etc. Gone are the days when girls were identified and associated with the words and symbols of jewelry, nail paints, lipsticks. We are more than that. We have reached the moon, we have proved our worth in sports, we don’t wear a gold necklace but we wear a gold medal in the neck proudly and boast it. We are the smart businesswoman, we understand economics and we play the stock market and yet look beautiful with those lip shades and nails paints on. We are the beauty with brains. We wear bangles but we are not weak. We are strong, we are admirable and courageous. “We are the women of today”. “As for girls, they must risk everything for freedom, and give everything for passion… loving everything that their hearts and their bodies love. The only thing higher for a girl and more sacred for a young woman than her freedom and her passion should be her desire to make her life into poetry, surrendering everything she has to create a life as beautiful as the dreams that dance in her imagination.” – Roman Payne. BOYS BUCK UP!! Its girl’s power everywhere ….